San Diego has great year round angling, even during mid-winter, and San Diego bay is perhaps the most consistent local winter fishery. Except for when storms are passing through, winter breezes are often less than summer winds. When the ocean has six to twelve foot swells as has been the case over the last couple of weeks, the bay remains comparatively calm. Spotted Bay Bass aka "Spottie"
Numerous species are available year round: recent catches include the ubiquitous spotted bay bass along with yellowfin croaker, bonefish, shortfin corvina, queenfish, jack smelt, halibut, mackerel, barred sand bass, black croaker, spotfin croaker. 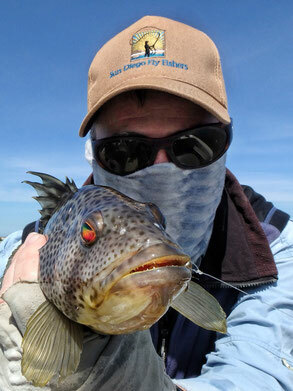 The spotted bay bass, AKA “spotty” is by far the most comment catch, but if you find yourself in the right place at the right time the other species will eat your fly. 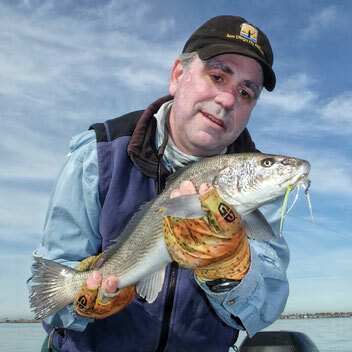 In many ways, the winter fishing on the bay is pretty much the same as the summer fishing except you may have an extra layer or two of clothing in the morning and a thermos of coffee, tea, or hot chocolate along for a quick warm up. The outer layers of clothing are often off and into the gear bag by mid-morning. Recent December and January weeks have seen morning sun rise air temperatures ranging from 40 to 55 degrees Fahrenheit and mid-day temps of 55 to 75. This Yellowfin Croaker took a Chartreuse/White Clouser Minnow. The Stroud Tackle staff prefers 5 to 8 wt rods for our winter bay fishing, matched with lines to cover from the near surface down to about 20 feet deep. If you are getting started or only want to have a single rod, a 7wt is a good all round rod, not only of the bays, but the surf and local lakes. Many anglers fish the local bays and surf with 6wt rods and a few of us use a 5wt. An intermediate sinking line (sinks at 1-2 inches per second) and a line that sinks about 4 to 5 inches per second will cover most situations. Something that sinks at 6 to 7 inches per second or faster will be useful if trying to fish the deeper channels. 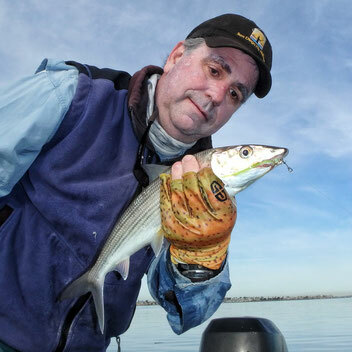 Faster sinking lines can also be useful when fishing during the winter king tides and their increased current speeds over areas that would normally be shallower during average tides. We like the Rio Mainstream Intermediate line or Rio Outbound Short Intermediate line for the near surface work down to depths of four to eight feet depending on current speeds. The Rio Avid Trout 24 ft sink tip is a great option for the six to 15 foot depths and the Rio Striper lines for depths of 8 to 20 feet. For the deepest presentations, or even shallower presentations in fast currents we recommend the Rio InTouch Level T 30 foot shooting head in the T-8 density matched with a Rio SlickShooter 25lb shooting line. The 30ft T-8 head can be used with 6, 7 or 8wt rods. We are a Rio Products dealer, but Scientific Anglers, AirFlo, Cortland, Orvis, and others have similar lines which will do the job. We tend to use level leaders of 5 or 6 feet made from 8, 10, or 12 lb nylon copolymer monofilament on the faster sinking lines and a 7 1/2 foot tapered leader with the intermediate lines. Corbina, usually associated with the surf zone, are found in the bay too. Fly choice can be simple. 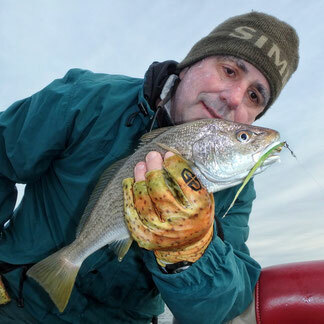 A size 6 or 4 chartreuse over white Clouser Deep Minnow will catch everything in the bay. Of course plenty of other flies work well. One favorite in calm conditions in shallow water is a merkin style fly fished slowly over eel grass beds with an intermediate line. San Diego Bay has very little shore access that is conducive to fly fishing. A boat provides the widest access and kayaks are nearly as good much of the time. Areas near National City’s Pepper Park, and Coronado’s Glorietta Bay and Tidelands Park area can be worked with pontoon boats. The two Coronado areas can also be worked safely with float tubes if you stay near shore. 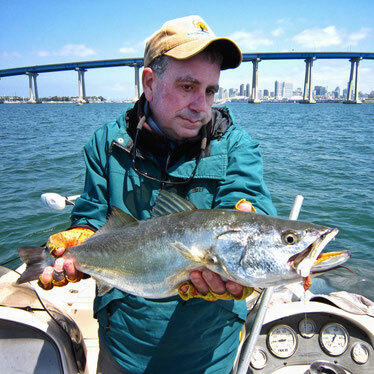 There are guides who operate trips on San Diego bay that provide an option for an out of towner looking for a day on the water or a local looking for an introduction into the bay game. We list some recommended guides elsewhere on this website.